Pieria lies geographically between Rapsani and Naoussa. It is well known for cotton, kiwi’s and mussel farms. Wine wise it emerged a decade ago yet insiders would have a hard time to muster a list of winery names as it has remained under the radar. A comprehensive tasting held in Katerini 4 years ago was an eye opener. The momentum created by 15 estates now reaches beyond promising. A number of rustic wine practitioners with poor packaging continue, though these are not issues which can not be fixed. As the potential is now been realized it was high time to go back and see what has developed. What a breath of fresh air, not unlike the afternoon breezes from the snow covered imposing Mt Olympus whose mass influences the local meso-climate. One of the front runners to emerge is Kitrus. Georgios Garipidis an oil executive and his twin sons Kostas & Alexandros founded this boutique in 2008 and their first ever vintage was the 2011. An unusual grape list was chosen, Malagousia, Verdicchio, Syrah and Aglianico. Soils are limestone alternating with sandy layers. The Syrah crosses five different soil variations. They are currently vinifying seperate the five blocks thus first comes the deconstruction to see their profile then by blending they craft the final blend. A new modernist winery is in it’s finishing stages. The Garipidis may have so far not struck oil on their farm but when building their initial cellar they came upon a more valuable cultural find. 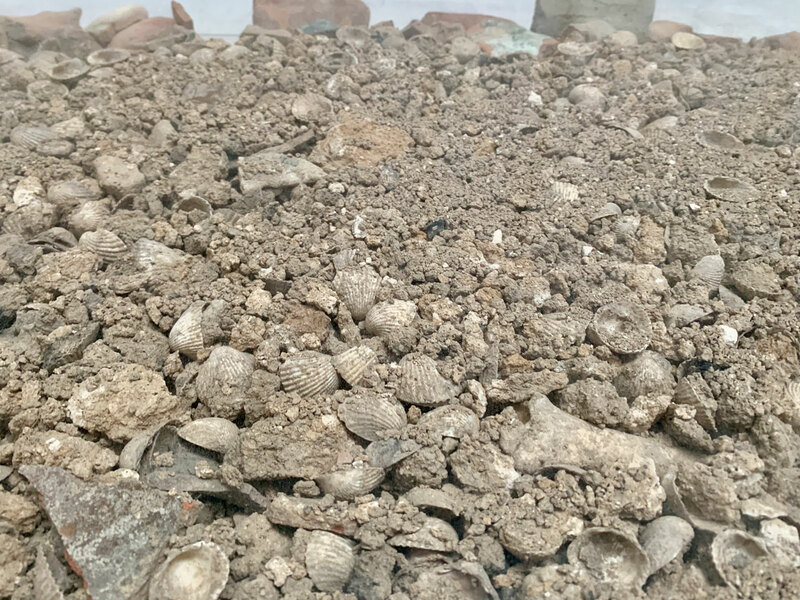 Amongst the gravel dug out they spotted charred oyster shells and chicken bones. In came the archeologists who were thrilled with this find. It is a guard’s diet whose remains were thrown in a camp fire dated from the Othoman period. This has been duly given it’s place of honor in the display of protein littered natures mosaic on a glass frame which adorns a wall of their tasting room. It also alerts us to this little known region’s rich in history memory. All Kitrus wines are on the right track. It is the Syrah that continues to impress as it adapts and expresses better than other incomer red grapes. Merlot & Cabernet Sauvignon have had their day. They continue to loose favour up and down the country of the 30’s something now on the scene, charting modern Greek wines future direction. Two hands on academics have valuable input in this going places address. Stefanos Koundouras has been an early mentor consulting in the vineyard. He has for 5 years strived to reduce the grape berry size of this sun and wind grape. Giorgos Kotseridis, who teaches at Athens University, is the consulting oenologist. The team is experienced with results in one’s glass compelling. Their wines are vibrant, tasty, balanced, and distinctive. Not forged by force per se more exploring an expression through a gentle understanding hand. Kostas Garipidis adds: ”White wines are fermented in cement with cultured wild yeast. Also moving for Syrah to cement and large oak foudres for ageing”. From 6 hectares they are now producing 35,000 hand crafted bottles. Kitrus is a winery to watch. There is a lot going on now in Pieria not only for hiking and seasonal mushroom foraging. Get your favourite map and start planning your next discoveries. Rich in sea and mountain delicacies this invigorated wine destination beckons discovery. North-east facing vines at 150m. Blueish black, opens up to raspberry scents, velvety tannins, supple backbone offering balance. Focused hedonistic flavour with gentle spice on the finish. Perfumed and long. How adaptable and expressive Syrah is. Very much European in style with a juicy generous Greek twist to it. One of the top varietal examples managing balance and racy freshness. 2019-2025.